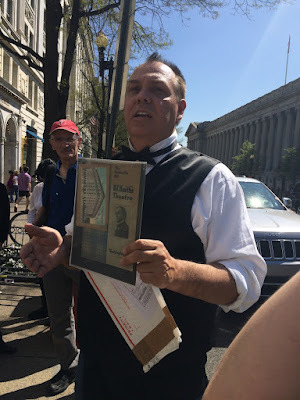 Atlas Obscura hosted a fun event yesterday in Washington D.C. that they called Houdini Escapes D.C.. 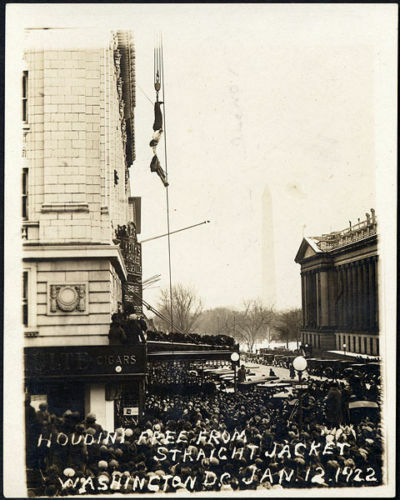 The event showcased Houdini's many visits to D.C.. 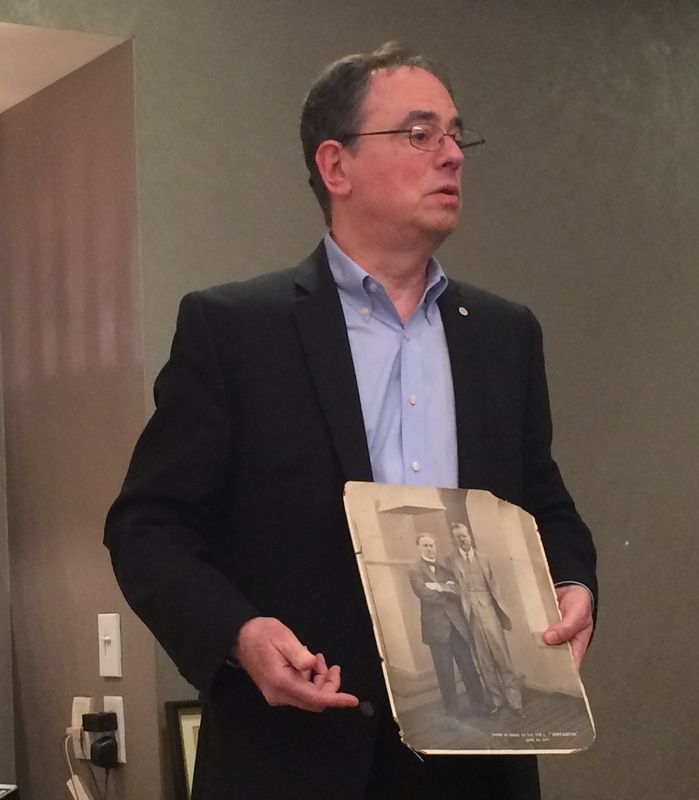 It was a two hour event that began with a viewing of Ken Trombly's Houdini collection. Ken also spoke for about 45 minutes about Houdini and his collection. Unfortunately, I missed this part, but I have seen parts of Ken's collection in the past and it's incredible! And thanks to Brian Suddeth, who was present, I can share some photos from Ken's presentation. As I mentioned, Ken has an incredible Houdini collection. I was blown away by all the posters he had the first time I saw them in his home. At the event he shared some of those posters and he also shared some smaller photos during his talk. The photo to the right shows Houdini's Metamorphosis poster, his King of Cards Poster, and one of my favs, the Prison Cell and Barrel Mystery Poster. I'm sure Ken gave information about each of the posters. The next photo from Ken Trombly's talk shows him holding a photo of Houdini and Teddy Roosevelt. This is a classic photo. Long before Photoshop existed, Houdini was altering photos! The actual photo has several people on both sides of Houdini and Roosevelt. But Harry, had them all painted over so it looked like he was the only one standing next to Teddy. It's ironic that Ken showed that photo, because I had planned to share the story about Houdini meeting Roosevelt on board the SS Imperator and performing for the former president. In fact, I was going to demonstrate the slate trick that Houdini fooled Roosevelt with, but I cut it from the show at the last minute because I didn't want to run long. After Ken's talk the attendees walked a short distance to Farragut Square Park to watch Carnegie (me) and Denise present a Houdini-like show. Because this was my portion of the program I'll tell you what we had intended and I'll tell you what actually happened. We planned to present the first half of the show AS Harry and Bess. We had our period costumes, we also had the same music Houdini used along with some other musical selections from that era. I was even going to do the Houdini-voice! However, the circumstances didn't really feel right for such a theatrical approach, so on the fly, I changed to more of a historical presentation. I still did all the material just in a slightly different manner. Thankfully, I have a fantastic assistant who knows to expect these types of things when working with me. Our show began with a quick, silent-to music escape sequence which started with a chain escape, a rope 'thing', and a single handcuff escape. The rope 'thing' is something I created a while ago and is actually part of a longer routine. It begins with a piece of rope about 3 feet long, dropped into a bag. My hands go into the bag and a moment or two later come out with my hands tightly bound! It's a cool moment and gets a nice laugh from the audience because they do not expect it. Next, I move on to the handcuff escape. In this instance a pair of Hamburg 8s were used. Boom, boom, boom, three quick escapes in under two minutes. NOT the way Houdini would have done them, but a nice way to present it for 21st Century audiences. Next I share a bit about Houdini the King of Cards and presented the classic Cards Across. 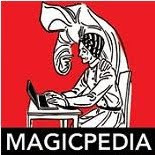 I chose this effect because it was one that Robert-Houdin presented and Houdini got his start in magic via the book, The Memoirs of Robert-Houdin. I figured it was very likely that Houdini presented this particular trick, even though I don't have definitive proof. The next segment was the multi-handcuff escape. Truly one of the most painful things I've had to endure. You see, I have a medical condition which has me on blood thinning medication. This medication causes me to bruise easily. From several days of rehearsal, I ended up with multiple bruises up and down both arms. In fact, we had to drop three pair of cuffs because they would no longer fit my wrists due to the swelling. I was still able to get 6 pair of cuffs on along with a pair of thumbscrews. Once I was all cuffed, I stepped inside my make-shift 'Ghost House', in other words a cloth cabinet, and proceeded to escape. I tossed the individual cuffs over the top of the cabinet after I was free of them. The last piece I removed were the thumbscrews, which I did in the open rather than inside the cloth cabinet. I followed the multi-cuff escape with my routine which I call Chaplin. It's basically a story about how Houdini met a young Charlie Chaplin in England before Chaplin's rise to fame. In the story, Houdini helps Chaplin earn some money by playing a guessing game of sorts and he is rewarded if he wins. I've presented this hundreds of times and it's always a fun routine, though it is better indoors in a theatre setting. The last item was a 100 foot rope tie. I got two volunteers out of the audience to help tie me up and well, I proceeded to escape. The wonderful thing about this escape is, you never know just how people will tie you up. People always go about it differently, sometimes they start with the hands, sometimes, they wrap you up first, it's always interesting to see what choices they take. After about three minutes I was completely tied and it took me about 2 minutes to free myself. Those two events, Ken Trombly's Houdini collection and my show, probably would have made for a perfect event. But there was one more thing yet to do. 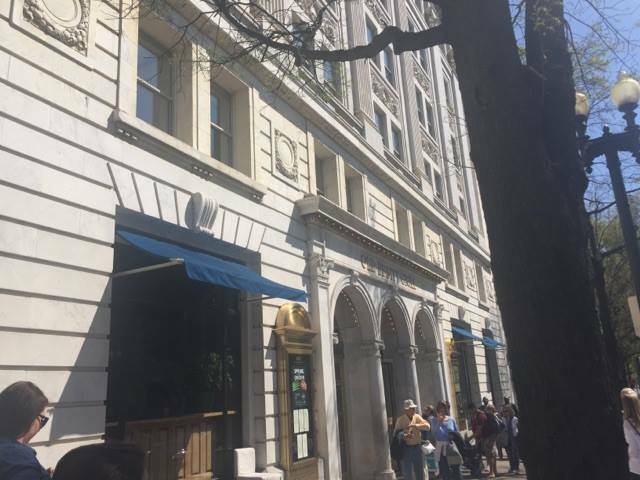 We all walked several blocks to the location of the old Keith's Vaudeville Theatre. The location is the corner of 15th and G St.. Today the spot is filled by The Old Ebbit Grill. But in Houdini's day it was Keith's Theatre. 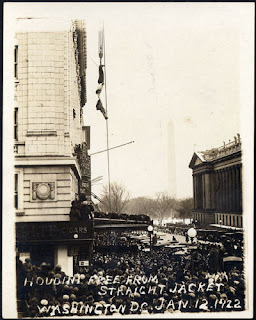 January 12, 1922, Houdini presented a hanging straitjacket escape from this location. It was his second straitjacket escape in DC but it's also his most famous due to the iconic photo of him hanging upside down in front of the building with the Treasury building on the far right and the Washington Monument off in the distance. 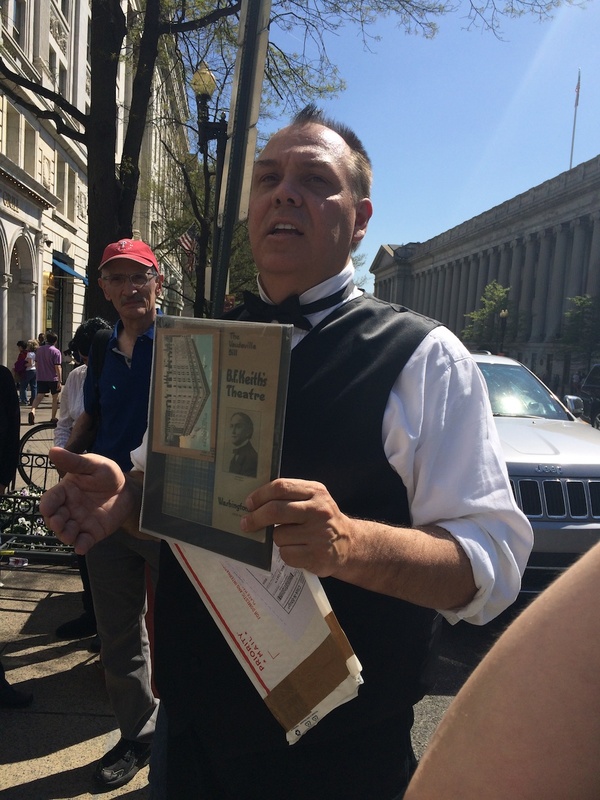 When we all arrived at the location, I spoke for 10-15 minutes about Houdini's escape and some of his challenge escapes he performed in D.C.. I also brought out an original program from Keith's with Houdini on the cover, along with a vintage postcard of the theatre. 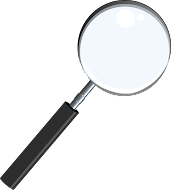 I took a few questions following the talk and we wrapped things up right there. Incidentally, if you go into the Old Ebbit Grill, the doors you walk through are the same entrance way that was used for the Keith's Vaudeville theatre. And if you walk to the back seating area you'll be sitting in the area that was the theatre auditorium itself. Great report Dean! HH also had his brother Leo airbrushed out of a family portrait. According to Christopher, Roosevelt left the SS Imperator the night before it docked in New York, and HH's camera was stolen on that trip.